Full disclosure regarding homiletics: I am not a fan of the books that provide thousands of sermon illustrations. I own several of them and just find them to be either a bit shallow or hard to personalize. I’m sure some people find them helpful, but in my experience they are generally a waste of time. So I’m skeptical of any books that provide illustrations or “exercises” that will make one’s preaching more effective. 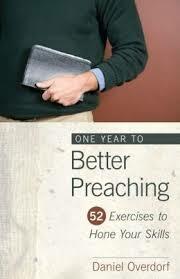 Thus, when I had a chance to review Daniel Overdorf’s One Year to Better Preaching: 52 Exercises to Hone Your Skills, I was partly intrigued because I am a preacher always looking for tips and partly skeptical that the book would be a waste of valuable reading time. Yet Overdorf is no homiletical novice. He is the dean of the School of Congregational Ministry and professor of preaching at Johnson University and had over ten years of preaching experience before he started teaching at Johnson in 2005. So it seemed wise to consider his work since it wasn’t a hodge podge of random editing choices. Overdorf’s work is full of life. If you are a new preacher, you should pick up a copy of his book because you will save yourself a lot of hard lessons learned over time and implement ideas ahead of the homiletical curve balls that will be thrown at you. For example, some of the ideas include “Have Listeners Evaluate You” (#8), “Assemble a Feedback Group” (#23), and “Critique a Video of Yourself” (#52). If you didn’t have the “pleasure” of experiencing these exercises in a seminary environment, these ideas could really help you. But the ideas aren’t remotely close to being simply “how to go through seminary homiletics training without going to seminary.” Most of the ideas are practical ways to get your congregation thinking, applying and worshiping God! Overdorf offers ideas to help congregations apply the truth of God’s Word in their lives (#20’s “Apply Specifically”). His ideas help congregations reach both different ages (#32’s “Assign Biographies to Children) and different ethnic cultures (#29’s “Expand Your Multicultural Awareness) and genders (“#21’s “Preach with Wmen Women in Mind”). The real value behind One Year of Better Preaching is how it has application in so many different churches, regardless of the epistemological assumptions or cultural traditions. This can help you regardless of whether you align yourself with Modernism and Post-Modernism and everything surrounding those two worlds. He travels very diverse roads, from remembering the fundamentals (#4) to encouraging people to text during sermons (#31). Overdorf wisely encourages preachers to implement a variety of homiletical styles too (expository, narrative, etc.). Not only are the exercises helpful, the corresponding chapters explaining those exercises are fantastic. They give enough specific information on how to do it so that those of us who are struggling can essentially “copy and paste.” Yet they leave a lot of room for creativity, so it would be easy to just take the principles and go for broke. Pastors could go through these exercises through the course of a year (52 weeks!) or could apply one once a month or could follow their own plan. The book is written so that it could be applied effectively in a number of ways, as the author himself acknowledges in the beginning. I’m delighted to say that I really couldn’t find any “weaknesses” to provide in this review. For what Overdorf was attempting to do, it’s a huge success. Some might want to have added a few other exercises, but you can’t fault an author for writing something that someone else wants to write. So I highly recommend this book if you are a preacher. It, along with Stephen Rummage’s Planning Your Preaching, would be extremely valuable for your service to your local church and would likely enhance your attempt to communicate God’s Word to your listeners!